ESBC9378-4B adds media transcoding capability to InnoMedia’s high performance and highly versatile Enterprise SIP Gateways (ESGs). 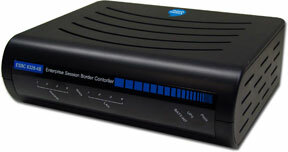 It combines Enterprise Session Border Controller (ESBC), business line FXS ports, switched data port, media transcoding, and internal battery, all in one unit. ESBC9378-4B can be used by service providers to offer SIP trunks to enterprises with B2BUA for IP PBXs (Figure 1) or with SIP ALG for IP Centrex (Figure 2). 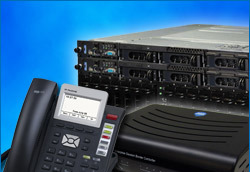 Designed for Broadband Service Providers (BSPs) offering SIP trunking, hosted voice, and high-speed data services, InnoMedia’s ESBC9378-4B is a highly integrated and highly manageable Enterprise SIP Gateway (ESG) or Enterprise Session Border Controller (ESBC) that can be auto-provisioned and remotely managed. Equipped with VLAN and DSCP packet priority tagging, ESBC9378-4B is ideally suitable for BSPs offering bundled services with end-to-end quality of service over broadband service networks. Its B2BUA and SIP ALG capabilities enable wide deployment by BSPs addressing SIP-PBX interoperability for SIP Trunking as well as providing simple NAT Traversal for Hosted PBX Services. 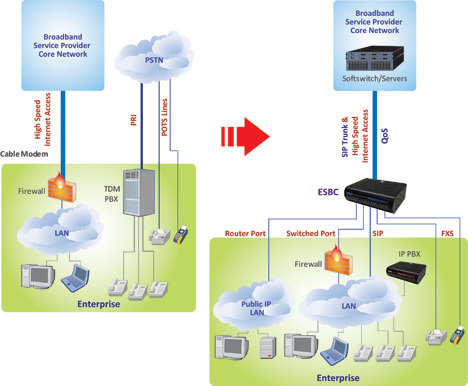 The two typical service scenarios for ESBC9378-4B are: 1. BSPs delivering high-speed Internet access as well as SIP trunks to enterprises with IP-based PBXs (Figure 3). 2. BSPs delivering high-speed Internet access as well as hosted PBX/IP Centrex to enterprises which will transition from legacy Centrex to IP Centrex (Figure 4). 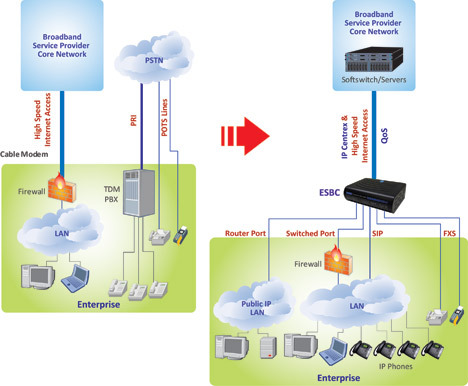 Therefore, the InnoMedia ESBC9378 offers broadband service providers the ideal product for delivering scalable SIP Trunking and Hosted PBX services to their business customers through the incorporation of advanced features such as SIP normalization, NAT/Firewall Traversal, QoS management, Performance Monitoring and Media Transcoding which address specific problems normally associated with these deployments.